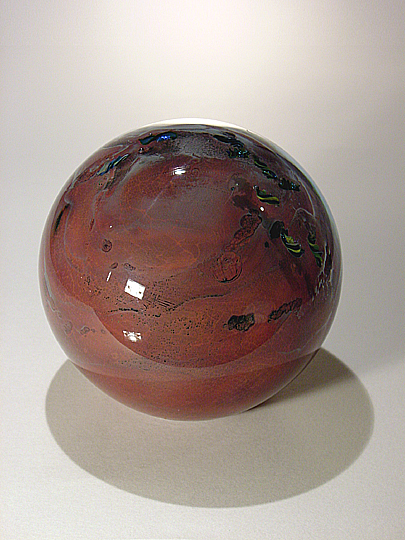 Josh is very well-known for his planets and megaplanets... they are included in many private and museum collections, including the White House Craft Collection and the collection of the Mint Museum of Craft + Design in Charlotte, North Carolina. 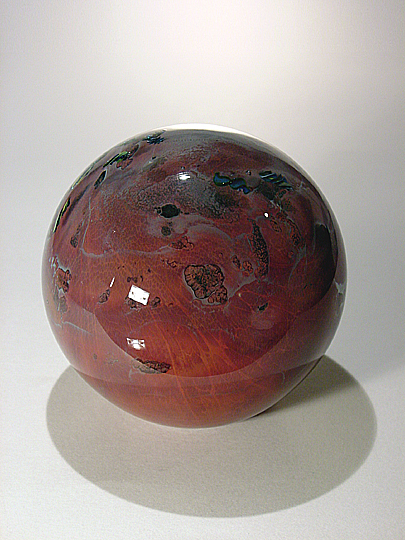 However, Josh's planets are usually not based on any existing planet... they tend to be fantastic creations. In this case, however, the planet is modeled after the planet Mars. Josh has done an awesome job of matching the color of this planet to the real Mars, and some of the Martian geography on this planet is similar to the real Mars. Of course, it wouldn't be a Josh Simpson planet if there weren't some spaceships orbiting it, and there are some here... perhaps they belong to colonists arriving on Mars in the future. This work is labeled a prototype because Josh was considering creating a much larger Mars for NASA... Josh's wife, Cady Coleman, is an astronaut who has flown on two Space Shuttle missions and who was in charge of deploying the Chandra X-Ray Observatory a few years ago. I am a big fan of both Mars and of Josh's work, so I am doubly glad to have this work in my collection.